Venus is the second planet from the Sun and the third brightest object in Earth's sky after the Sun and Moon. It is sometimes referred to as the sister planet to Earth, because their size and mass are so similar. Venus is also the closest planet to Earth. The surface of Venus is hidden by an opaque layer of clouds which are formed from sulphuric acid. The planet is named for Venus, the Roman goddess of love and beauty and is the second largest terrestrial planet. 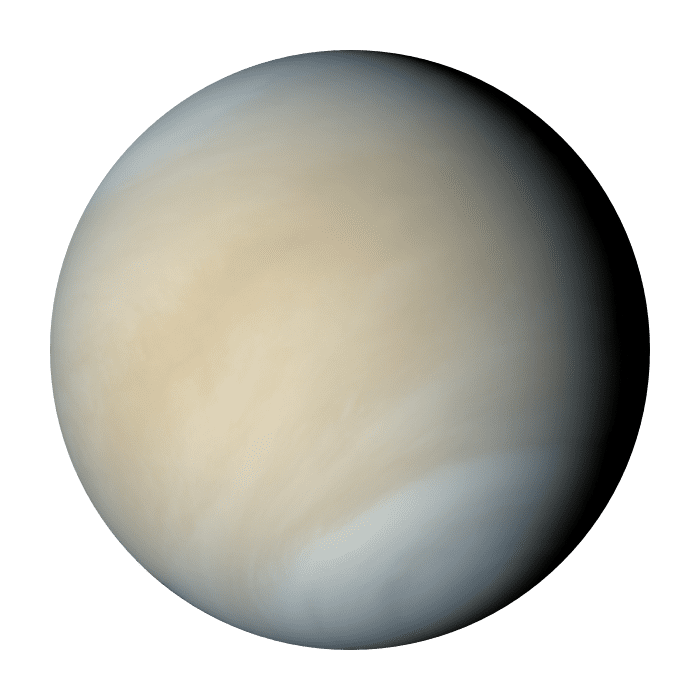 Billions of years ago, the climate of Venus may been similar to that of Earth and scientists believe that Venus once possessed large amounts of water or oceans. However, due to the high temperatures produce from the extreme greenhouse effect, this water boiled off long ago and the surface of the planet is now too hot and hostile to sustain life. Firstly, with an atmospheric density of approximately 480° C. This easily makes Venus’ surface the hottest of any planet’s in the solar system. A second unexpected discovery regarding Venus’ rotation is its speed. Taking approximately 243 Earth days to complete a single rotation, a day on Venus is longer than on any other planet. This alone is noteworthy. What is even more striking, though, is when Venus’ day is compared to its year. At roughly 224 earth days, Venus’ year is almost 19 earth days less than one Venusian day. Again, no other planet shares such a property. The leading theory for this phenomenon is that which is used to explain the planet’s retrograde rotation.